Master keyboard shortcuts and get more done in less time. Shortcut Coach shows you relevent shortcuts as you work. Shortcuts are only displayed when you use the mouse to activate a command. It's like having your own Shortcuts Expert right there while you work! We’ve all been there before: Rushing to meet a deadline or trying to complete that one last project before going home for the day. You find yourself slowly navigating around Excel with the mouse, your brain moving faster than you can move the mouse. You wish there was a better way! Maybe you know you should learn shortcuts, but if you stopped to look up shortcuts every time you worked, you’d take even longer to work! Now there’s a solution: Shortcut Coach teaches you shortcuts effortlessly as you work! Simply work as you normally would and when you use a command, Shortcut Coach will remind you of the shortcut you could (should) have used. Whenever you activate a command with the mouse, a small popup box will appear in the corner of your screen reminding you of that command’s shortcut. The pop up fades out over a few seconds and won’t interfere with your work. 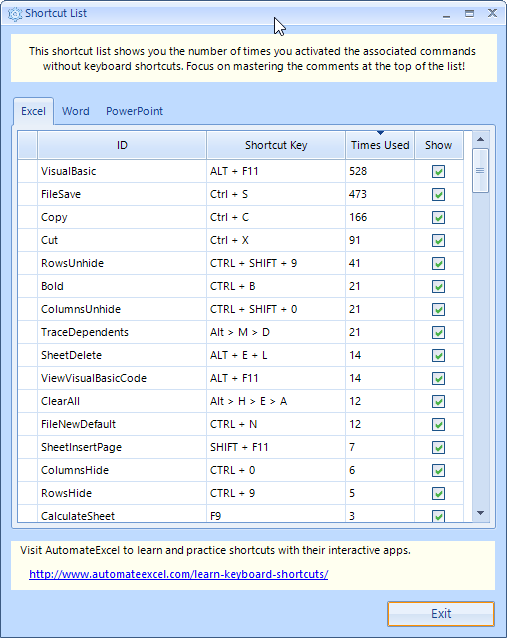 Shortcut Coach contains hundreds of shortcuts for Excel, PowerPoint and Word. In addition, the Shortcut List will show you which shortcuts you used most often, so you can focus on learning your most commonly used shortcuts first. 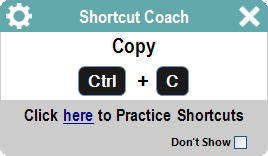 Shortcut Coach is the easiest way to learn shortcuts. Simply work as you normally would and over time you'll learn shortcuts for your most common actions. Mastering keyboard shortcuts saves you massive amounts of time! 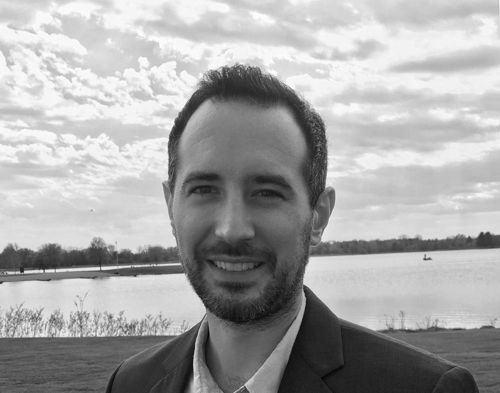 When I first started working with Excel, I'd become frustrated with how much time I spent doing tedious work. I'd slowly move the mouse across the screen, click one button, then move the mouse back to click a cell and so on. I was wasting hours of my life each week. I knew I needed to learn more shortcuts, but in the moment it was so much easier to use the mouse than to look up the shortcut online or look at the cheatsheet next to my desk. Shortcut Coach is the perfect solution to this problem! Simply work as you usually would and you'll learn shortcuts effortlessly as you work.